I did enjoy this book for the most part. Hoover's descriptive capabilities know no bounds. At times though I was put off by her pretentiousness. I felt for her and her husband, wanting to get back to nature and be more in touch with the environment after years in Chicago. As the years go on and their piece of wilderness becomes less and less remote, there is constant push and pull between the idealistic life they want to live and facing facts about reality and human nature. However, when she started speaking in possessive terms ("our animals"), she lost me. Just because the Hoovers befriended wild animals doesn't mean they were "theirs" any more than they belonged to the casual summer visitor passing through. They belong to no one. They belong to the forest. They bless us with their presence and remind us of things we can't quite understand. And the truth is, the Hoovers altered the forest by their mere presence and by caring for the animals that they encountered arguably as much as a hunter with his shotgun or tourists with their cars.Favorite quotes: "We were too busy with necessary things to think much about ourselves, which is the way it used to be with most people. ""I wonder what percentage of the world's troubles come out of people being suspicious or afraid of people who aren't like themselves." - Ade Hoover"There would be difficulties yet, but we were now very experienced in the art of coping. All in all, the view from the rim after the years of climbing was good." In 1954, Helen Hoover, who was born in 1910 at Greenfield, OH, studied chemistry at Ohio University, and became a research metallurgist for the International Harvester, and her husband Adrian (Ade), a commercial artist, left their hustle-bustle life in Chicago, IL, and bought a remote cabin in the far-northern Minnesota woods. The events of their first year and a half, ending with a fire in Ade’s workshop, were chronicled in her book A Place in the Woods, and story of their relationship to the deer that came to their cabin is told in The Gift of the Deer. The Years of the Forest is a sort of summary of the sixteen years that followed, from 1956 to 1967, when the increasing encroachment of civilization led them to “take a vacation” in search of another wilderness home, with an epilogue about their return in 1971, with the outline taken from a casual, random list of “Things to Do” jotted down by Ade, including “Install wiring, Running water, Inside toilet” and “Get another car” after their old one had broken down. It has been republished as part of the Fesler-Lampert Minnesota Heritage Series. For anyone who has a secret longing to leave the problems of society and live an eremitic life a la Thoreau’s Walden, this book, subtitled “A down-to-earth (and delightful) book about wilderness living and nature adventure by the author of The Gift of the Deer and A Place in the Woods,” will be fascinating. A few references to man as more highly evolved and how the animals are related to us occur, but there are several statements about the wonders of creation and some citations of Scripture. Also, a little bit of environmentalism is found, but it is mostly the old-fashioned conservation variety rather than the modern “kill all the people to save the animals” whacko kind. Ade is said to swear on a number of occasions, but no actual swear words are used except that the exclamation “Great God” is uttered once and the “d” word twice. The period covered in this book also records the writing of another book by Helen, The Long-Shadowed Forest. In addition, she wrote some books for young readers, such as Animals at My Doorstep, Animals Near and Far, and Great Wolf and the Good Woodsman. I love Ms. Hoover because she appreciates animals the way I do. I envy her because she had the stamina to live in the north woods of Minnesota for years, rarely heading to even the tiny town near the cabin she and her husband shared. I can hardly put my computer down, but she spent hours watching and feeding the animals who lived near her.Most impressively, she and her husband refused to take power or telephone hookups, because it would mean clearing trees, and though the land technically belonged to them, they knew it belonged to the animals who lived there.I find her writing a bit rough - though the descriptions are lovely, sometimes I have a hard time keeping track of how much time has passed, and there are times when I have to re-read a paragraph to figure out what she means. It's always worth it, though, to picture the deer and squirrels and other animals who entertained Ms. Hoover and her husband for years. Two artists, he an illustrator and she a writer, leave Chicago and go to live in a cabin in Northern Minnesota. They are truly "off the grid" no electricity, no running water, novehicle (evidently in route to their new home their car gave out). They have to haul woodon a toboggan to heat the cabin.There were few neighbors in winter and even in summer the neighbors seemed to considerthem eccentric "kooks". They soon became literally starving artists. Mrs. Hoover even developed scurvy.I consider myself quite an animal lover, but the Hoovers took it to another level. Evenwhen they didn't have enough to eat, not only would they not consider killing any of the numerous animals on their property, they shared whatever they had with the animals. Sometimes allthey had was a little oatmeal or some pancakes. Also, they got up in the middle of the nightwhen their resident groundhog came scratching on the door for something to eat. Theyseemed to get almost every animal and bird either eat out of their hand or at least not run from them. I have never had that success with the wildlife I feed. They did create a problem by feeding the deer which they felt were starving. Theycreated the perfect hunting spot for deer hunters and they had limited success withkeeping hunters off their property or keeping the deer in a safe area next to the cabin. The Hoovers did feel superior to their neighbors who came to the Northwoods to enjoy it without embracing and preserving the environment. "Years of the Forest" is a companion book of Hoover's engaging tale, "A Place in the Woods", and covers approx. 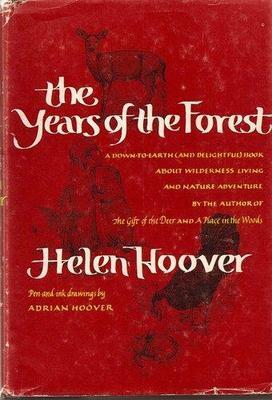 13 years of the Hoover's life in the Minnesota wilderness during the 1950's-60's as Helen and Ade continue their study of the wildlife that populate their small slice of Eden. Each chapter features a task that the couple completed on their property along with studied observations of the animals that come to see the Hoovers' as a non-threatening source of sustanance. In return, the various deer, chipmunks, red squirrels, groundhogs, bobcats, linxs, frogs, etc. provide much needed inspiration and humor for the couple as they write about (Helen) and draw (Ade) the animals in their habitat for articles (and later these very books). The Hoover's approach to life is simple and spartan and harkens back to a pioneer spirit and rugged individualism that most of us today can only faintly imagine. Their brand of conservation is more distilled and daily applied then most environmentalists today could ever handle. They truely "walked the walk". Helen and Ade were often let down by mankind, especially as increased development in the MN wilderness and careless poachers needlessly destroyed some of the Hoover's animal friends. The final 1/4th of the book covering the late 1960's and early 1970's was really sad to read, as the Hoovers watched their little Eden slowly being covered over in asphalt roads, trailer homes, and a mindset that didn't honor the interdependance of nature. In the final chapter, Helen, while disappointed in the changes wrought by her fellow humans, also realizes that through her and Ade's small efforts, they were able to bring about a change of their own. One that was positive and that would live on in the woods and creatures they called home and friends. Unwilling to give up reading aloud even though I'm done homeschooling, I talked my husband into listening as we went through this together. I'd picked up the book at a library sale some time ago. Helen Hoover and her husband Ade (short for "Adrian") moved from the city to the woods of Minnesota in 1954. This book tells about their life in the forest, working on fixing up their cabin and mostly living amongst animals. And I really mean AMONGST. They seem to have left doors and windows open and let every thing go in and out as they pleased, except for the black bears. My husband kept saying, "She's a nut!" The description of the yard filled with ducks and their animal welfare program ("We bought 400 pounds of corn, all we could load into the car...") was amazing. I also found it interesting that they survived on canned food for years, delivered by a grocer because they didn't have a car. What a wild adventure. Not for the faint of heart! Helen and Adrian Hoover left Chicago to live in the northwoods of Minnesota in the early 1950's, in a remote area that is now part of the Boundary Waters. In this book, Hoover tells the story of the various projects they undertook each year on their cabin or property. She also tells the story of the natural world around them. Her portrayals of the animals and birds near their home are utterly amazing. These creatures become characters, with thoughts and feelings. Yet Hoover also shows the harshness of the northwoods, and the difficulties it presents for all its residents. Hoover's prose is beautiful, vivid, and almost spiritual, and is enhanced by Adrian's line drawings of the landscapes, birds, and animals. The Hoover's decided to give up living in Chicago in the 1950's and move to a cabin in norther MN, and live the basic life. Helen Hoover was a writer and a successful chemist. Adrian was a artist. They live for several years without a car, walking into town in all types of weather to shop/pk up mail etc. to 16 years later, being able to finally take a vacation. The book chronicles how the Hoover's befriended the north woods, animals, weather and people. Helen Hoover, RDC-M, #3, 1973, @ 1973, 7/76. The Hoovers move from the city to the Minnesota wilderness in 1954. Adrian had a short to-do list that actually took 16 years to complete. This is the story of their education in wilderness housekeeping and the challenges they faced at each step. Okay. This book follows up Helen Hoover's "A Place in the Woods". This book covers the major events of the several years following the Hoover's move to the Minnesota north woods. Like "A Place in the Woods", this is written in a humorous style that I found enjoyable to read. More on the couple who moved to the wilds of Canada. Having read Helen's other two books I felt like this one repeated stories. They weren't new and fresh. Also, this book lacked the warmth and excitement of discovery that the others had. It's an alright read for nature writing. It's about some middle-aged hippie writers who try to live in rundown cabins in the wood and something is always going wrong.